Of course there's a lot to see and a lot to do in Jena. For example you can visit one of the 3 biggest museums of Jena. There's the "Phyletische Museum" (phyletic museum), which handle with evolition and all lifeforms and there's a big collection of stuffed animals. So on it always has very intresting exhibitions. Than there's the Dann gibt es das "Optische Museum" (optical museum) where you can follow the history of Jena glass and you find a lot to do by yourself like "seeing-tests" or optical deceptions, and the latest exhibition is about holograms. And of course we have a town museum called "Göhre" where you learn everything about the history of Jena. If you don't have the desire to go into a museum, why not goin in the "Botanischen Garten" (botanic garden) where you can see plants and flowers from all around the world. And there are many pyranias too. 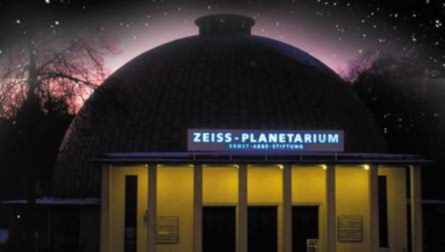 Next to the botanic garden is the Zeiss Planetarium, which was founded by Ernst Abbe (and of course it has git Zeiss equipment which also nowadays is exported in cities everywhere on earth). It has got many beautiful and instructively shows about the universe and there are two fantastic lasershows too. Then there are two movie theaters and a lot for walking in the environment. I very recommend the Galaxsea, a very nice swimming pool, too. If you have some more time then go to see the "Schott-Vila". It's the "experiance glass" in completly different way.